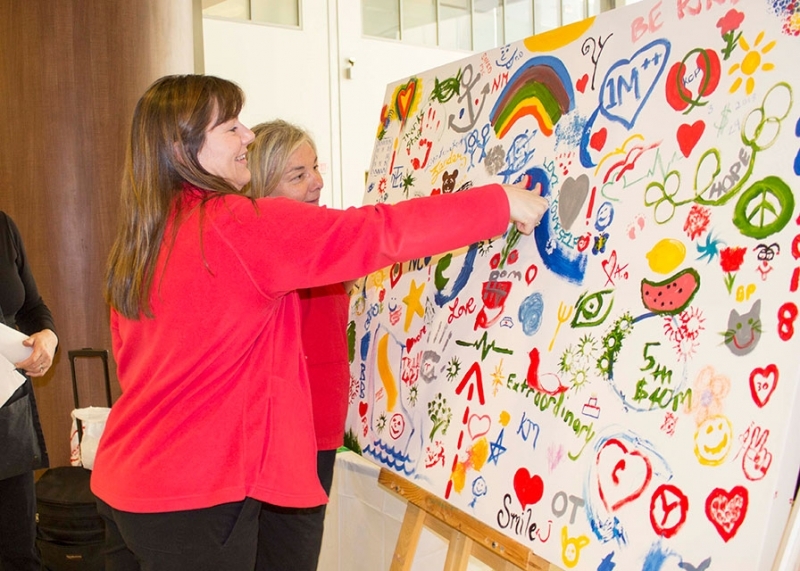 “Road to recovery, giving up is not an option, saved me, love yourself, be kind and smile” are just a few of the encouraging and inspiring messages that patients, visitors and Niagara Health team members painted on a canvas to be hung at the front entrance in the St. Catharines Site. There are also colourful symbols – red hearts, happy faces, a bright yellow sun, arrows, fingerprints, initials and other images that hold special meaning to the artists. St. Catharines artist Helen Michlik is leading the community art project, which is part of the St. Catharines Site’s fifth birthday celebration. Hundreds of people were invited to make a stroke, swoosh or anything they were inspired to paint on the canvas to mark the March 24th birthday. The artwork now resides with Helen who will add some final brush strokes to connect all of the unique designs. The finished product will be hung in the lobby of our St. Catharines Site as a symbol of the hospital’s fifth birthday and the first five years of our journey to create a Healthier Niagara. More updates will be shared once the artwork is ready to be revealed.